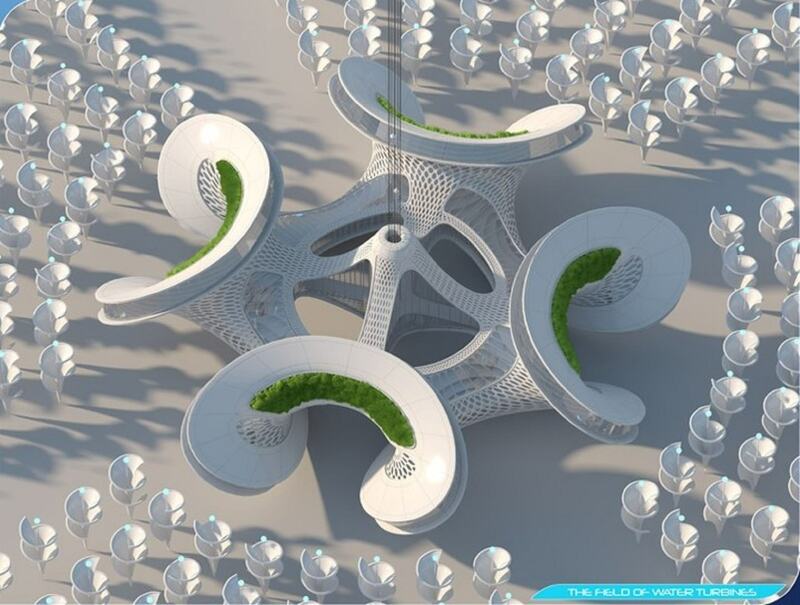 His eco-friendly futuristic innovative designs have inspired and amazed the world all over. 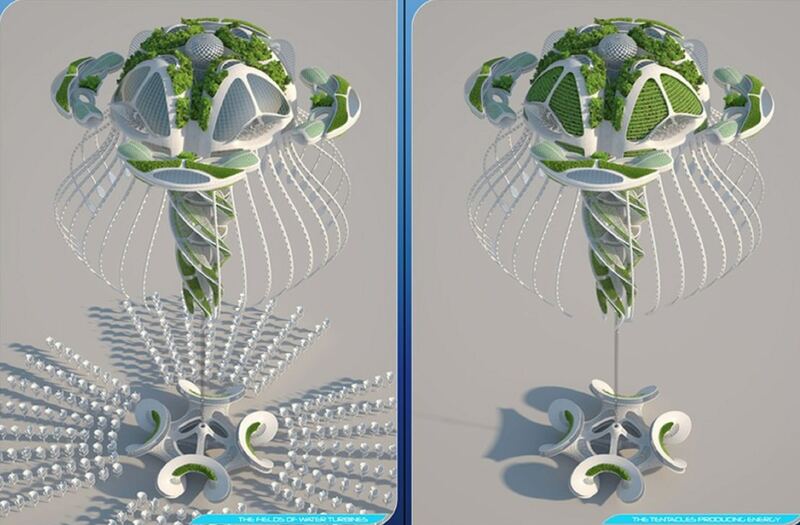 He gets inspiration from the Nature to leave no efforts to implement in his designs for the betterment of mankind. 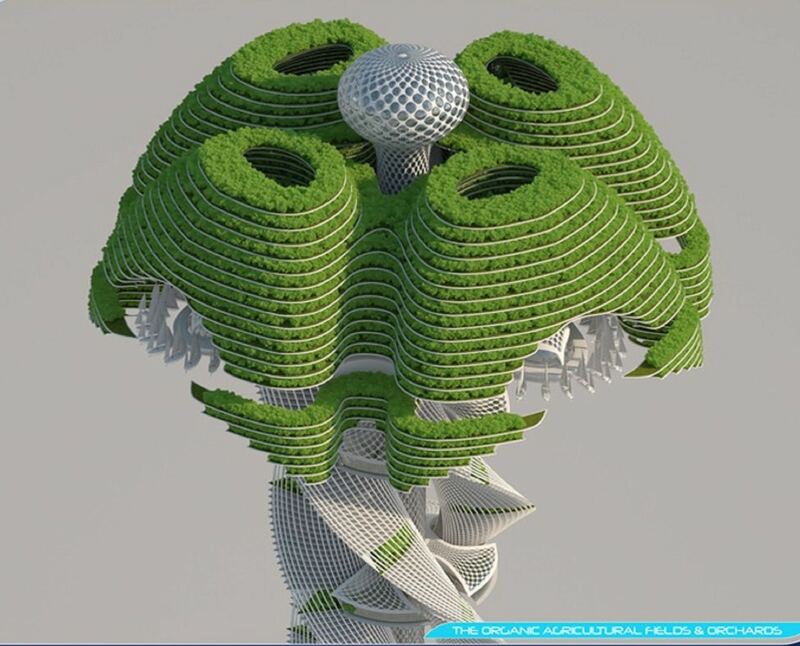 One of the most renowned architect-designers in the World, Paris based Vincent Callebaut’s projects inspire fellow colleagues, students, developers and the citizen of the world. He has won many prestigious awards with his innovative design creations. 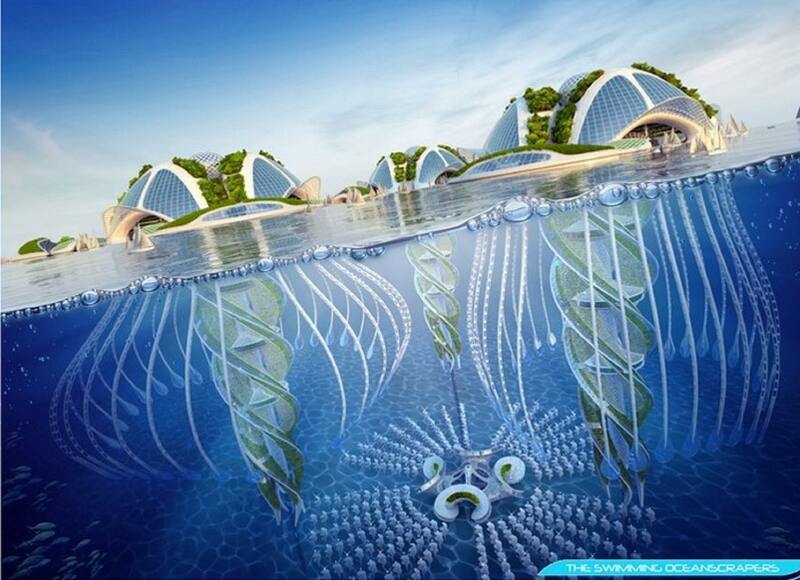 Johnny D: Please enlighten Design Trends’ esteem readers about your futuristic innovative Oceanscrapers’ Project. 1. 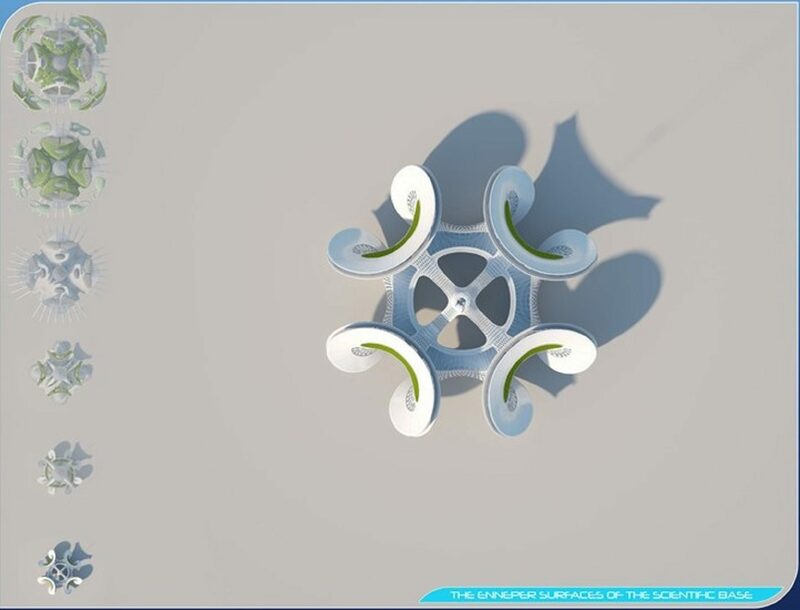 To recycle the ocean’s plastic pollution and transform the floating garbage patches into building materials for the naval architecture / engineering. 2. To fight against the ocean acidification by protecting the marine life. 3. 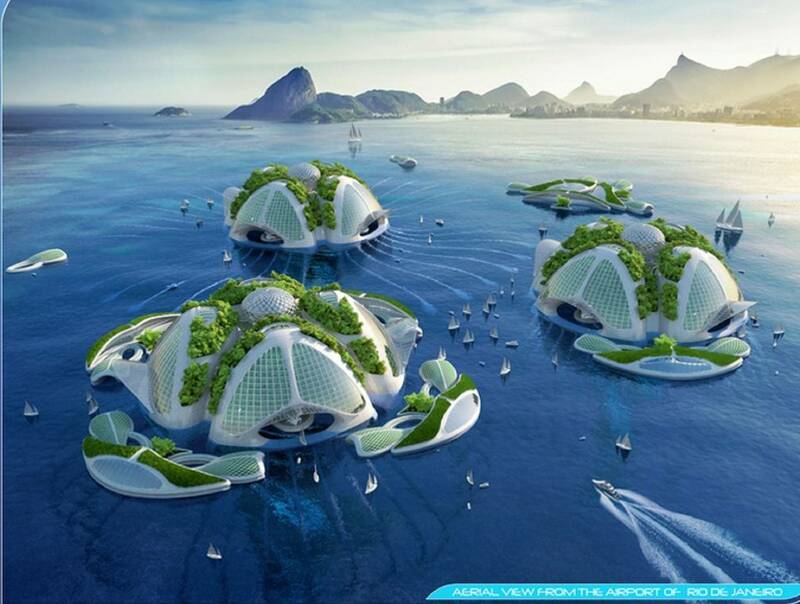 Provide sustainable housing to climate change refugees by creating a new civilization: the Seamen. 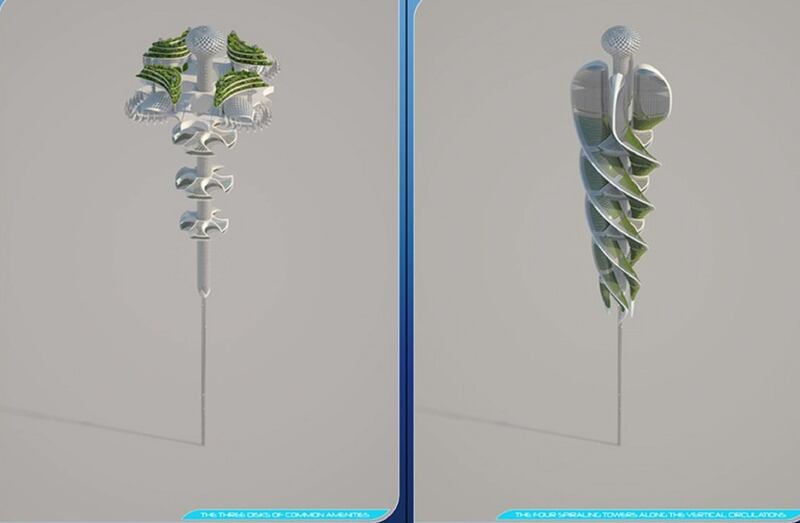 Aequorea: A multi-use Oceanscraper printed in 3D from the Seventh Continent’s Garbage will be located at the 5 Ocean Gyres and Rio de Janeiro, Brazil. The humungous housing surface area will be spread in 1,375,000 m² area. 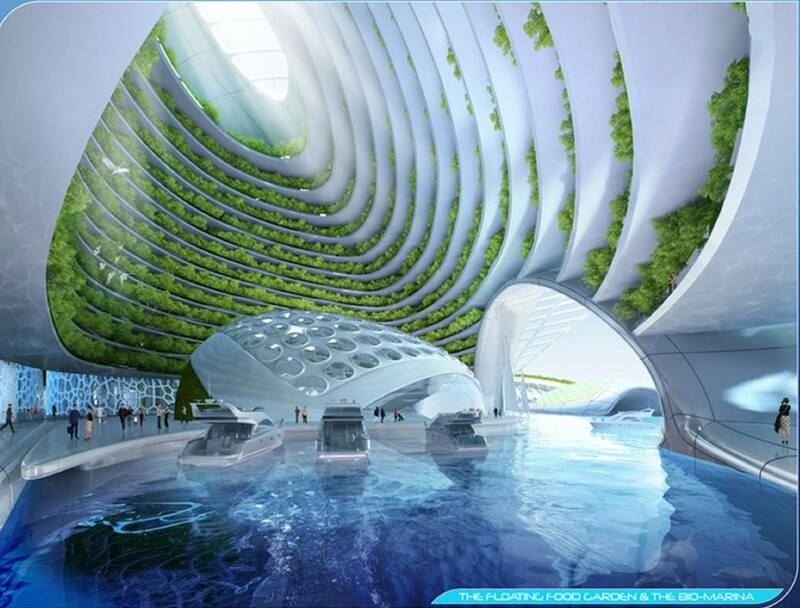 The program will have infrastructure for 10 000 housing (ranging between 25 and 250m²), fab labs, offices, co-working spaces, workshops, scientific basis, sea farms, organic agriculture, community orchards and food gardens, phyto-purification lagoons, coral gardens, etc. 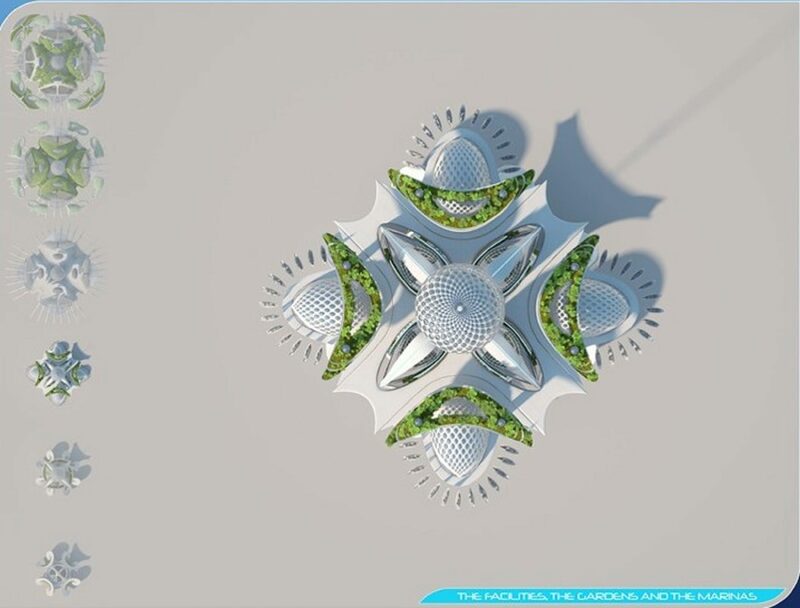 It will have the dimensions of 500 meters width, 1000 meters depth and 250 floors (1/4 for permaculture and agro-ecology). The building cost is estimated to be 1950 euros/m². 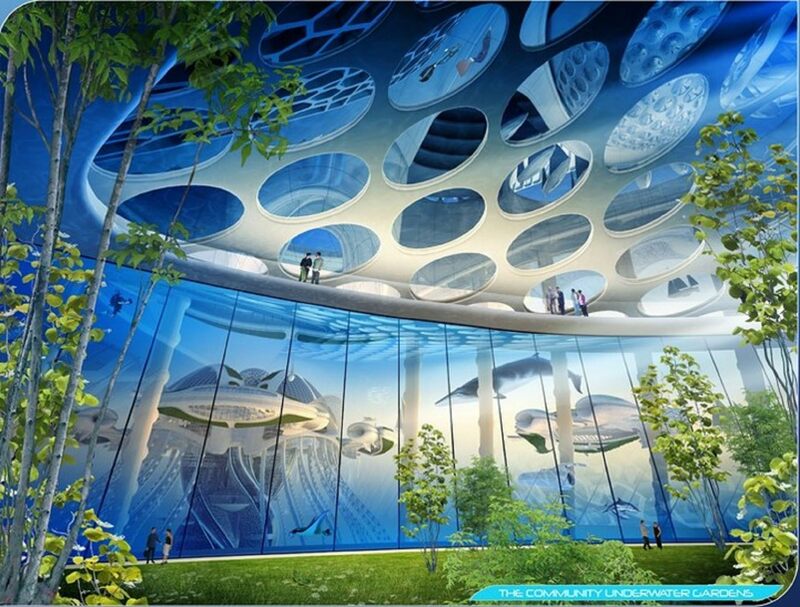 The ambitious project is expected to be ready by the 24th of December, 2065. 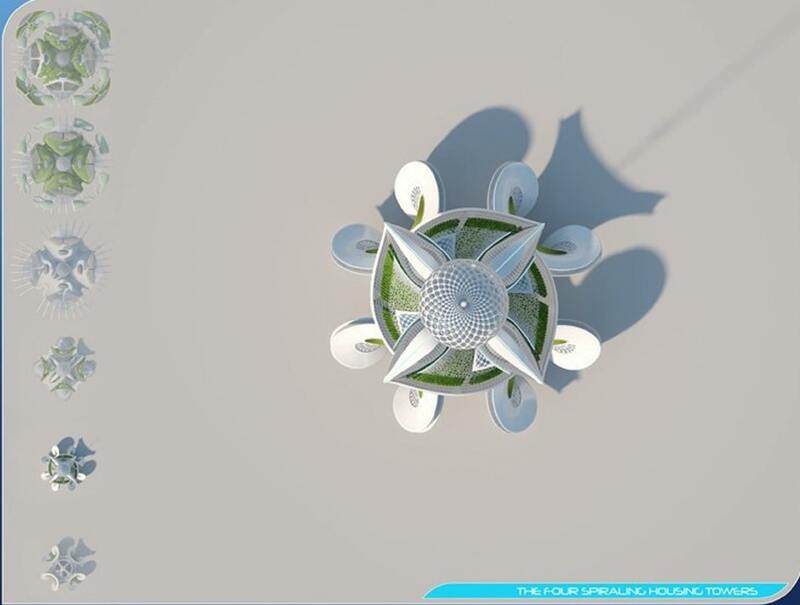 Imaginative, innovative, eco-friendly and challenging are some of the main aspects of Aequoera. JD: You have used a nouvelle manner to explain about the drastic consequences of pollution of our modern world through a trainee’s eyes. Please share with our esteemed readers in detail about the project. My name is Océane. I’m 15 years old. I’m an aquanaut teen. 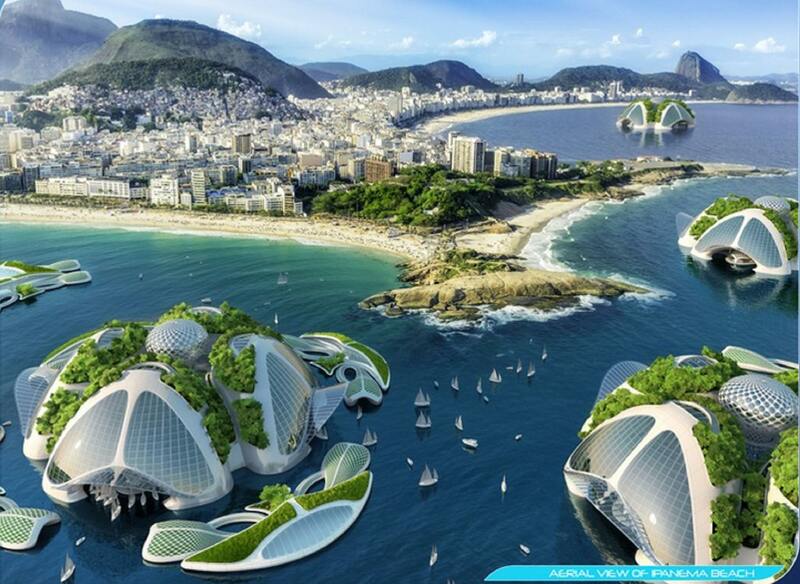 I was born in immersion in the 2050 in an underwater farm called “Aequorea”, located off the coast of Rio de Janeiro. Bio-inspired, the farm draws its name from a bioluminescent, light-emitting jellyfish characterized by its articulated, webbed tentacles. 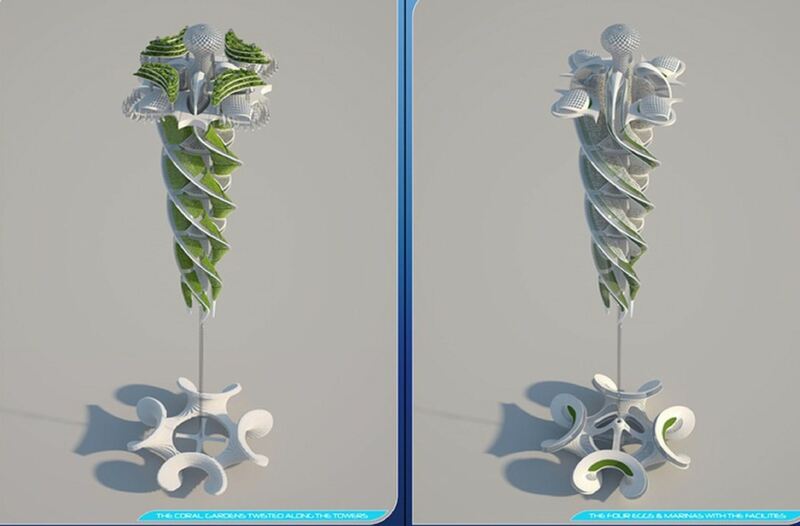 These tentacles enable it to swim and ensure its stability, while producing its own energy. My grandparents are oceanographers and architects. 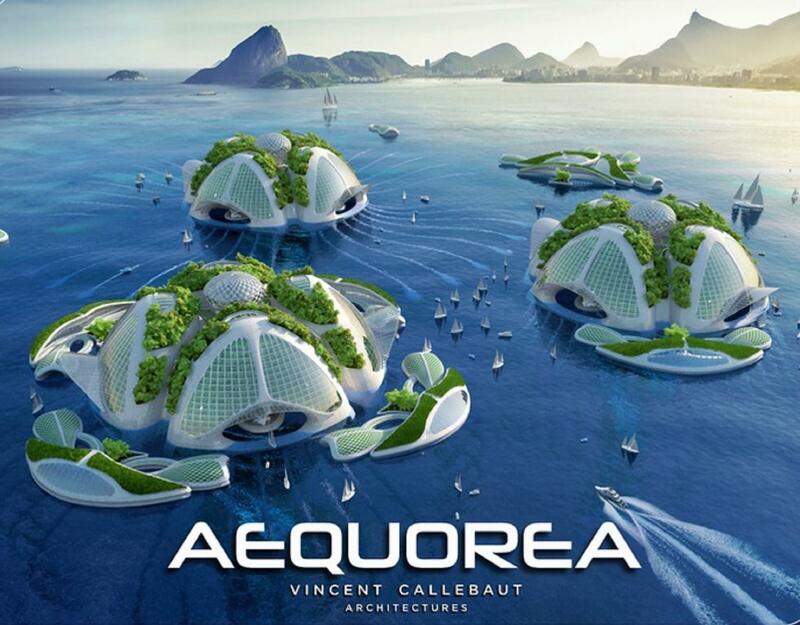 For the past 50 years, they’ve been participating in the collaborative construction of Aequorea. 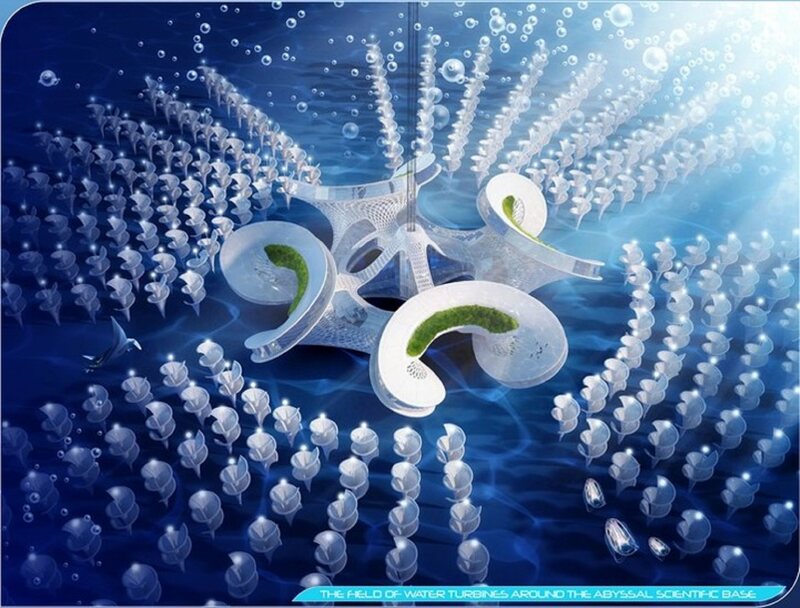 It’s a genuine underwater village printed in 3D from algoplast, a composite material they invented that mixes algae with garbage from the 7th Continent. You know, the 7th continent? 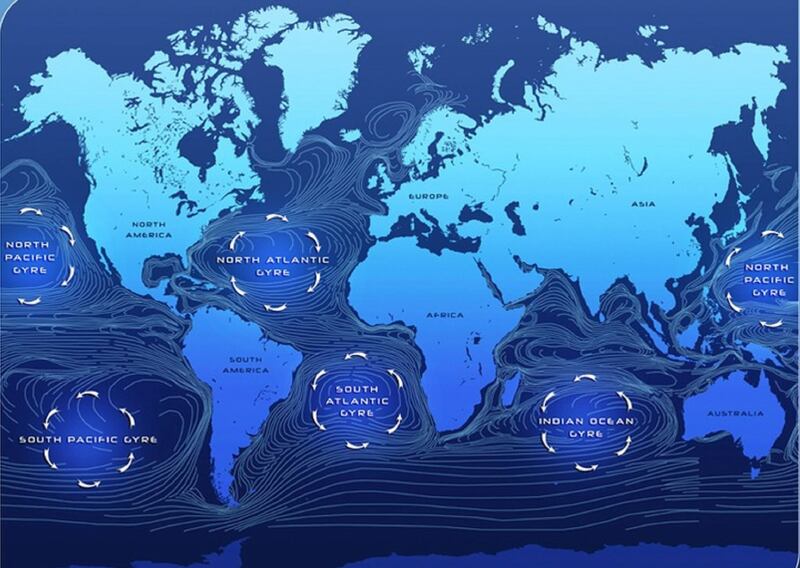 That infamous soup of plastics formed at the beginning of the Century in the heart of the five main ocean gyres, where the Coriolis effects causes the currents to swirl. In the 20th Century, on Earth, every human being was producing garbage up to ten times their weight annually. Two hundred and sixty-nine million tons of plastic waste with a life expectancy of a thousand years were thus produced every single year. More than 10% of it were ending up in the oceans. My grandmother explained to me that, geopolitically, the 7th continent didn’t belong to any state. It was indeed located in international waters. Through negligence, no one wanted to commit to cleaning those 27 million tons of plastic waste trapped by the sea currents in the heart of their vortex. “The oceans, which cover 71% of the surface of our blue planet, had become the dumping ground of humanity,” she told me. Well, my grandparents, together with a community of scientists, decided to extract value from this disgusting soup of petroleum-based waste by recycling it. They formed an NGO to defend an ethical approach to the oceans. Aboard their weird ships inspired from the Klein bottle, they tirelessly sorted and crushed into granules – bottles, cans, bags and other types of packaging. They filtered the micro-particles suspended at depths of 10 to 30 meters (30 to 100 feet). 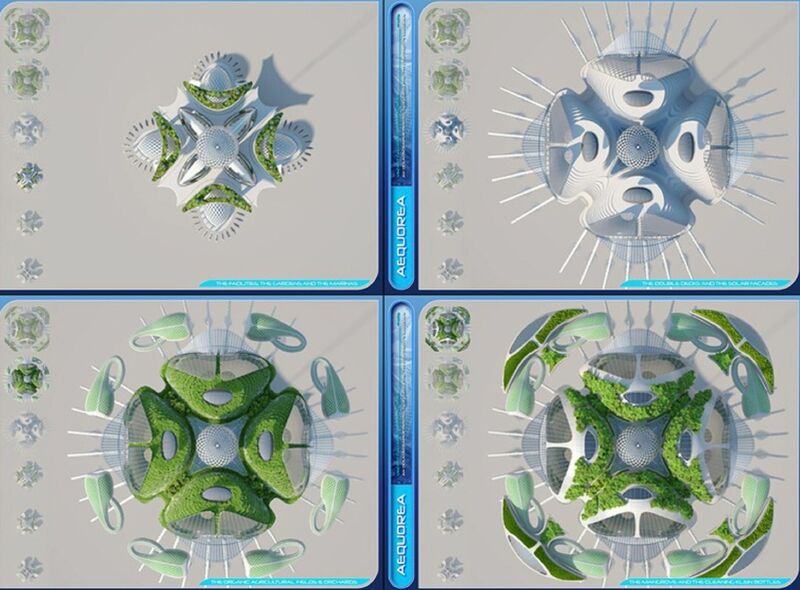 Inside moon-crescent-shaped floating workshops and fab labs, they mixed this raw material with an emulsion of gelling algae, to extrude it in the form of eco-friendly filaments. 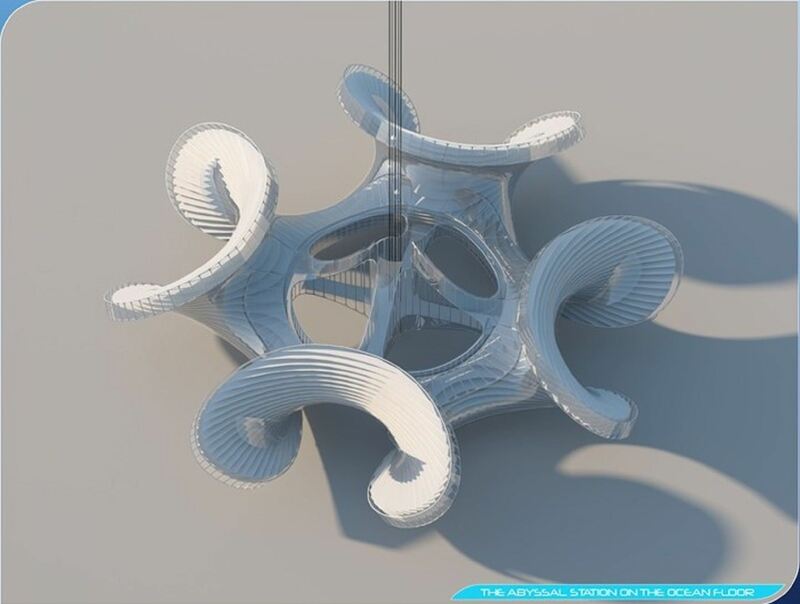 Those reels of eco-friendly filaments were then used by 3D architectural printers to reinvent naval construction. As soon as 2015, they began the repurposing of plastic waste dumped by the ‘People of the Land’ into impervious, durable materials. When my grandfather tells me about his terrestrial way of life of the time, it seems totally preposterous today. ‘The People of the Land’ supposedly, self-proclaimed Homo-sapiens took “Two Centuries” to understand that they were living on finite territory with limited natural resources. They were consuming the city like a commodity, rather than a common good that should be nurtured in symbiosis with nature. They were suffocating from inhaling urban smog – the infamous photochemical clouds caused by pollution. Without knowing it, they were ingesting plastic by infesting the food chain. By overfishing, they had almost emptied the supply of fish in the oceans. In this December month of 2065, it’s still hard for me to believe how carelessly the ‘People of the Land’ mortgaged the fate of future generations. It is true that, since the COP21 which took place in Paris in 2015, and the COP22 which took place in Marrakech in 2016, tensions had risen between the Western governments and the African countries, the former denying the latter the right to reproduce the fossil-fuel-based energy model that had enriched them so much. Fortunately, the Archibiotic boom changed the game. 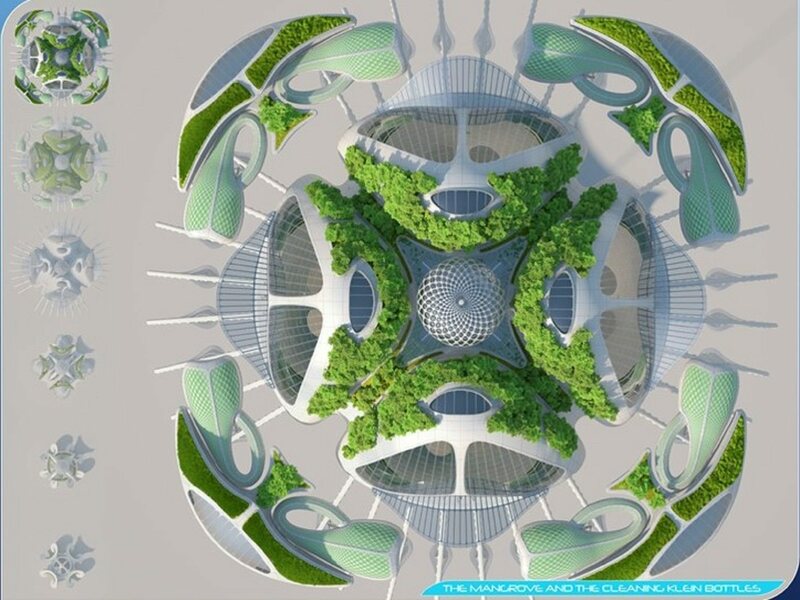 This biomimetic type of architecture — using advanced renewable energies together with Information and Communication Technologies (NTIC) — gradually offered energy independence to each state in the world. Oil conflicts — that obsolete energy — thus died down quietly. 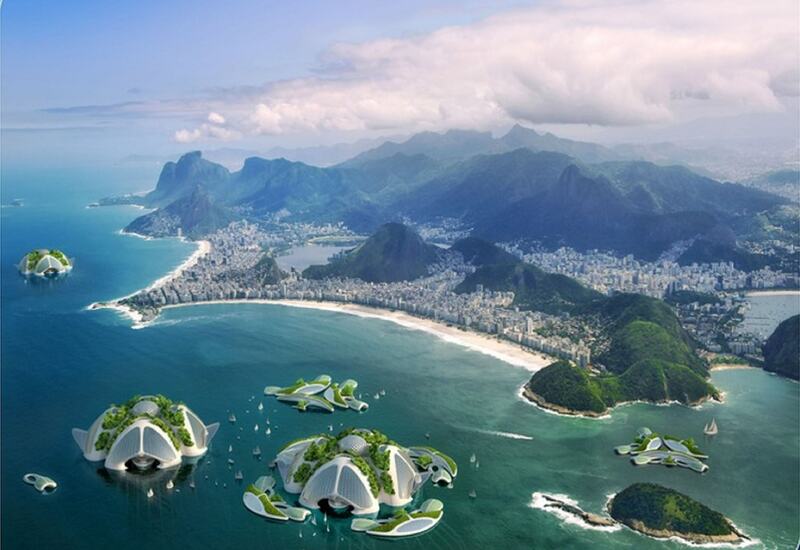 Faced with climate change and the rise of water levels, a new civilization emerged: the ‘People of the Seas’. Once their lands and islands were underwater and salinized, a large portion of the 250 million climate refugees got involved with interdependent NGOs like the one my grandparents created. 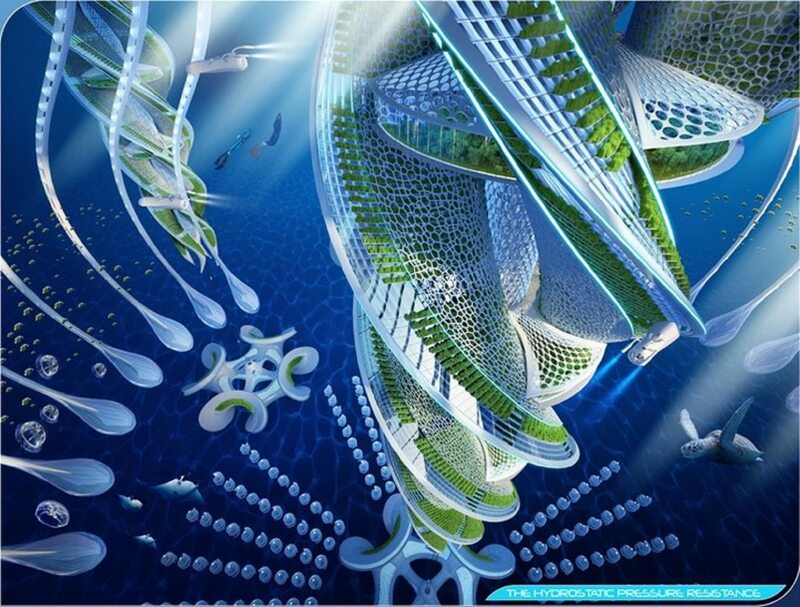 Together, they invented new underwater urbanization processes that were energy self-sufficient by recycling all waste and fought ocean acidification. Even if the oceans absorbed 22 million tons of carbon di oxide (CO2) from the atmosphere every day, mankind with its excesses of CO2 emissions had saturated them, and their pH had destabilized all the ecosystems. The ‘People of the Seas’ objective was to explore the abyssal zones in a respectful way, in order to speed up innovation and to democratize new renewable energies — by definition inexhaustible — massively. This community fought the capitalist frenzy rubbing its hands at the idea of plundering the last petroleum, ore and methane resources through drilling and fracking natural habitats at great depths. To develop new scientific, energy, pharmacological and food resources unsuspected until then: such was their credo in 2015. 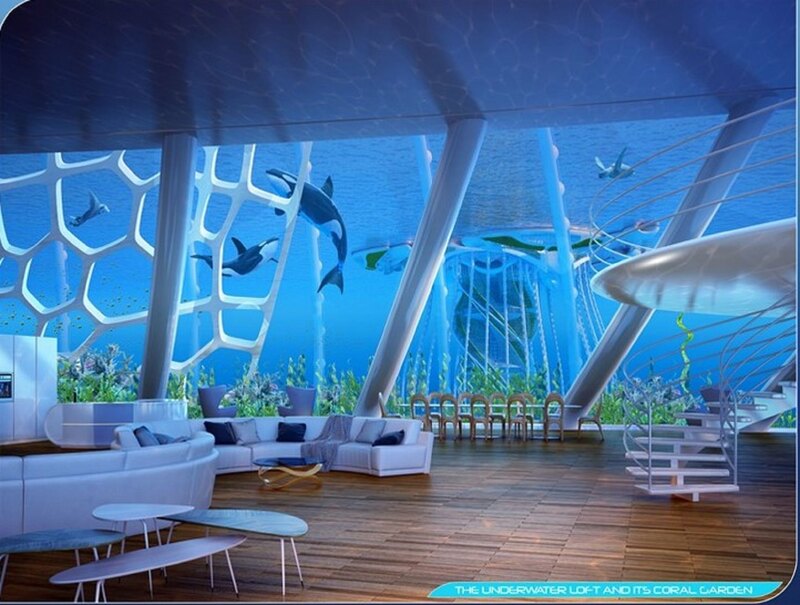 ‘People of the Seas’ with their blue economy were thought of as crazy! In times of obsolescence, people much preferred to dream and escape to Mars after having plundered everything on the Earth! For the past 50 years, these inhabitants of the sea managed to revolutionize the way we live together through environmental resilience and intensive energy transition. 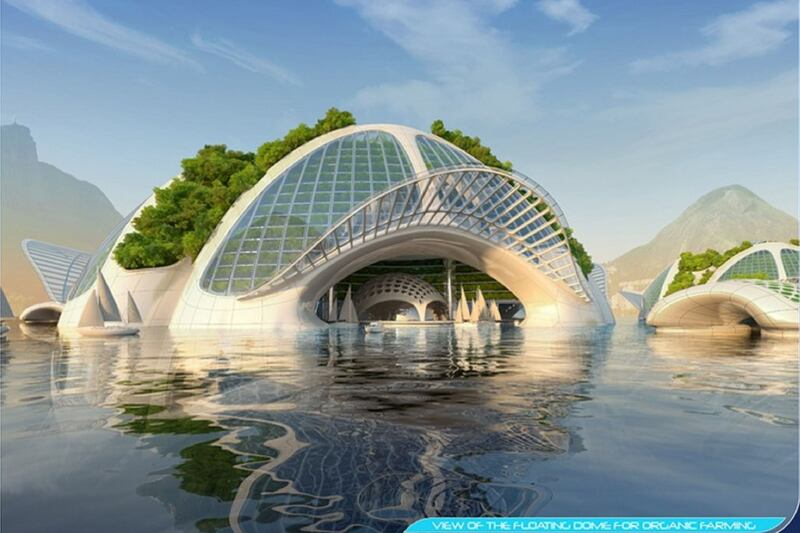 They won the challenge of recycling 100% of the 7th Continent’s plastics into a sustainable habitat. 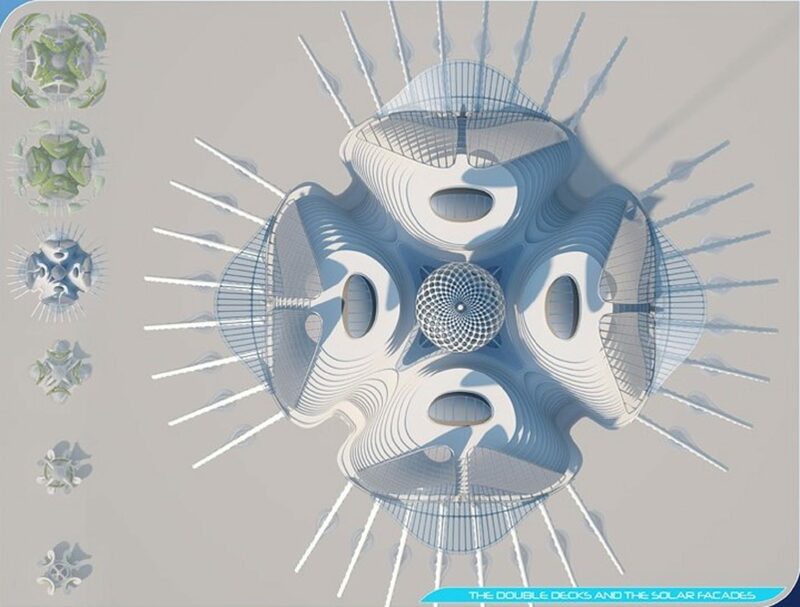 Since then, the Aequoreas continue to self-build through eco-friendly, natural calcification, in the same way sea shells do — by fixing the calcium carbonate contained in water to form an external skeleton. 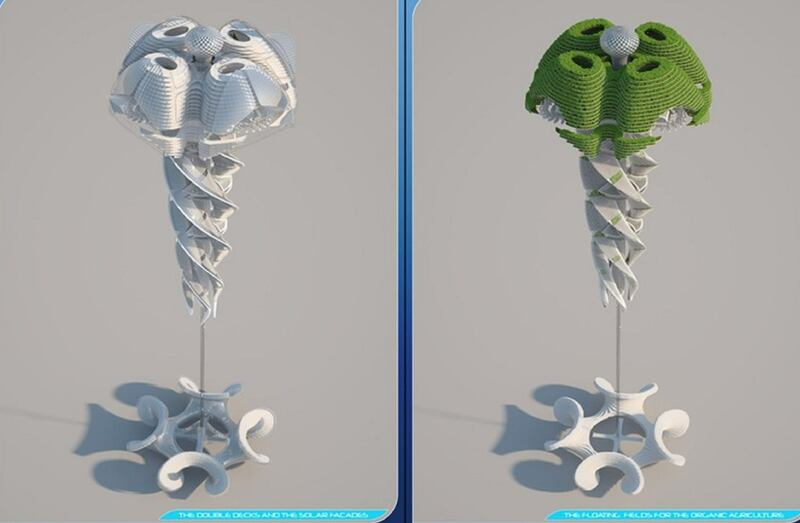 These are genuine blue carbon wells shaped like twisted towers 1000 meters (3280 feet) deep. By using aragonite (which has a high carbon component) as the construction material for its transparent façades, an Aequorea can fix 2,500 tons of additional CO2 per square kilometer (250 acres) annually. 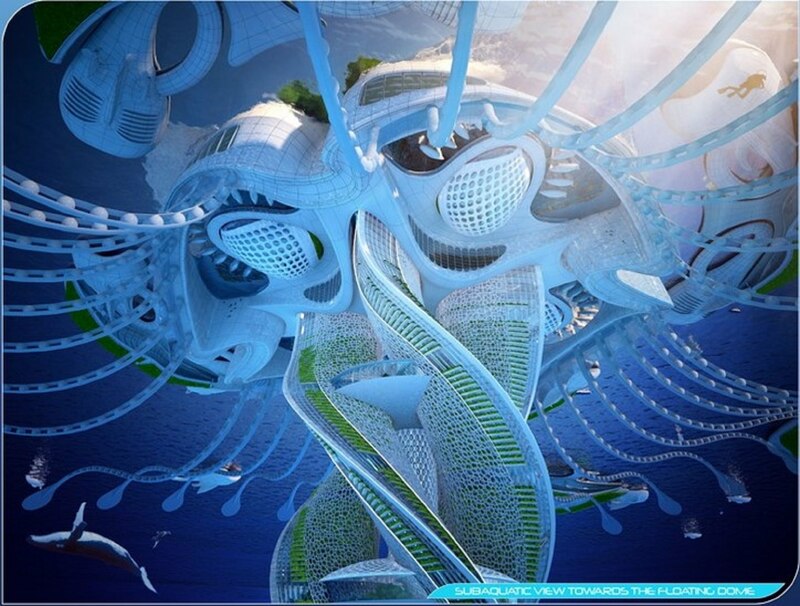 Each Aequorea village can welcome up to 20,000 aquanauts. 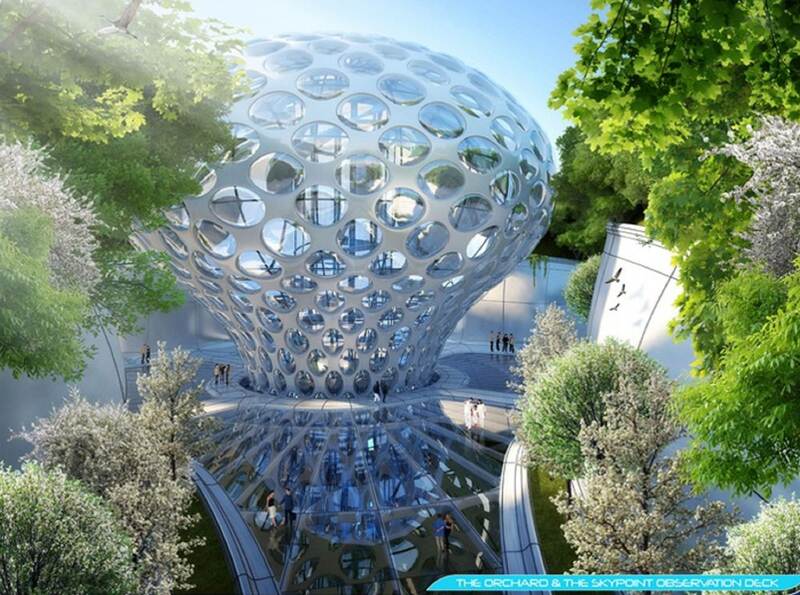 Their main access is on the water surface, through four marinas covered with a mangrove rooted on a floating dome 500 meters (1640 feet) in diameter. 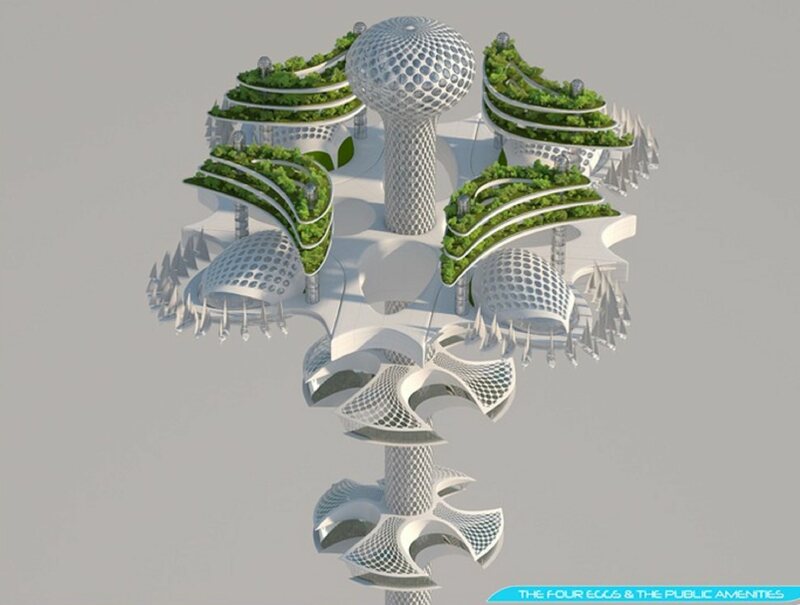 Modular living, co-working spaces, fab labs, recycling plants, science labs, educational hotels, sports fields, aquaponic farms and phyto-purification lagoons stack up layer-by-layer. The twisting of the towers is ultra-resistant to hydrostatic pressure. 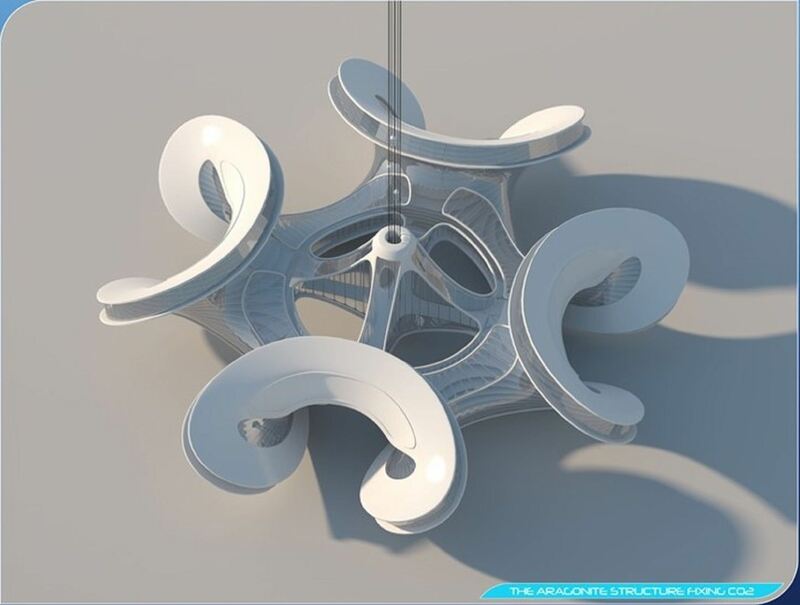 Its geometry allows it to fight marine whirlpools and thus reduce motion sickness. Its double shell accommodates the ballasting. 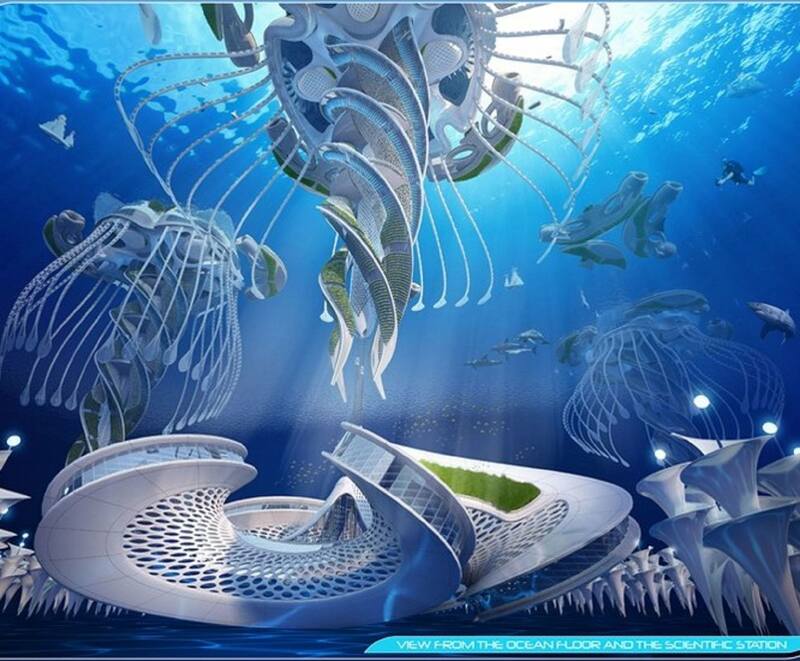 Once filled with seawater, the ballasts lower the Aequorea’s center of gravity to counteract the Archimedean buoyancy. They guarantee stability in the event of a storm or an earthquake. The double shell’s thickness increases from the sea surface downwards, to compensate for the strain caused by the increase in pressure. I am going to explain to you all everything we, the ‘People of the Seas’ have invented in the heart of the ocean. There’s no longer any need for scuba tanks to breathe underwater: put on your gill mask, designed to capture water and extract oxygen molecules; your micro-bead suit, like a dolphin skin; and your carbon fiber mono-fins inspired by whale tails! There’s no more need for coal, oil, gas or nuclear energy to get light: we reproduce bioluminescence in the double glazing of our apartments, thanks to symbiotic organisms that contain Lucifer, in which light emits through oxidation. 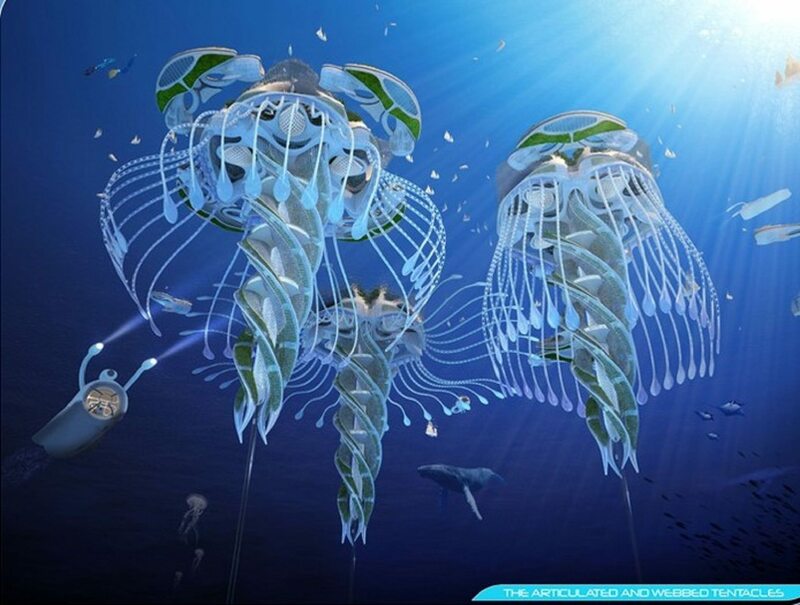 On the ocean floor, a field of water turbines shaped like volutes and laid out in a star pattern around an abyssal scientific base, turn the sea currents into electric energy. An Ocean Thermal Energy Conversion (OTEC) power plant completes the panel of energy supply. Located in the central vertical axis, it uses the difference in temperature between the warm surface water and the cool water pumped deep down to produce continuous electricity. In order to produce drinking water and fresh water for aquaculture, the OTEC power plant uses the in-depth pressure to counteract the osmotic pressure, and to separate the water from the salt via a semi-permeable membrane. 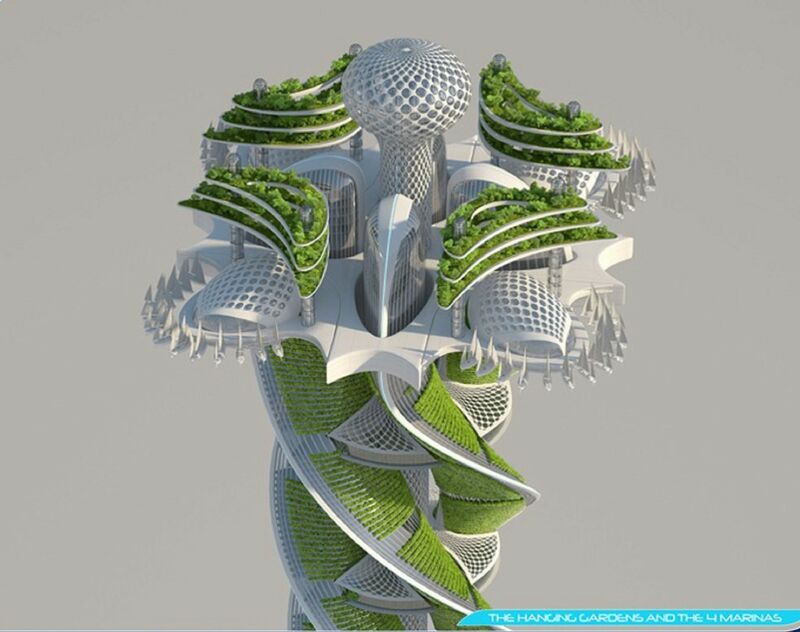 Air is renewed either naturally by convection through wind chimneys innervating the four branches of each tower’s twist, or by the oxygen station via seawater electrolysis. For heating and climate control, we no longer use fossil fuels. 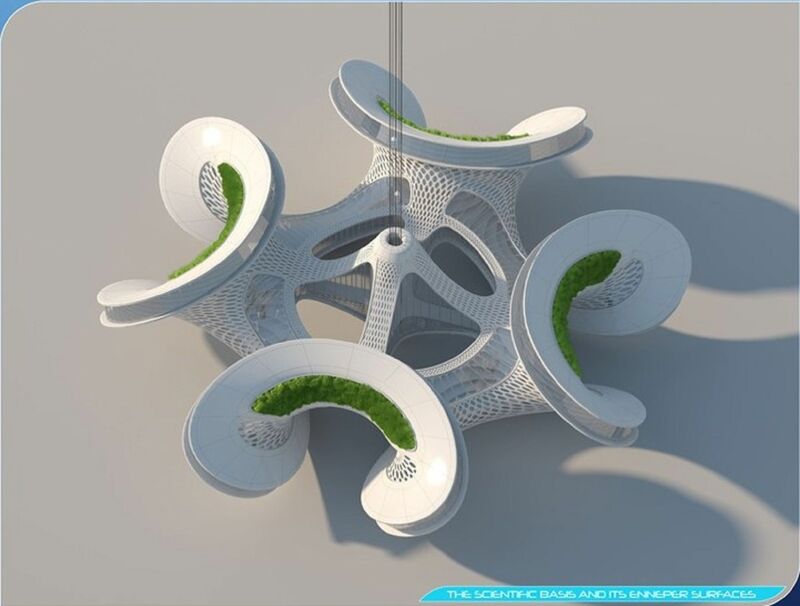 Rather, we use micro-algae grown in aquarium walls, which absorb the carbon dioxide produced by people’s breathing. 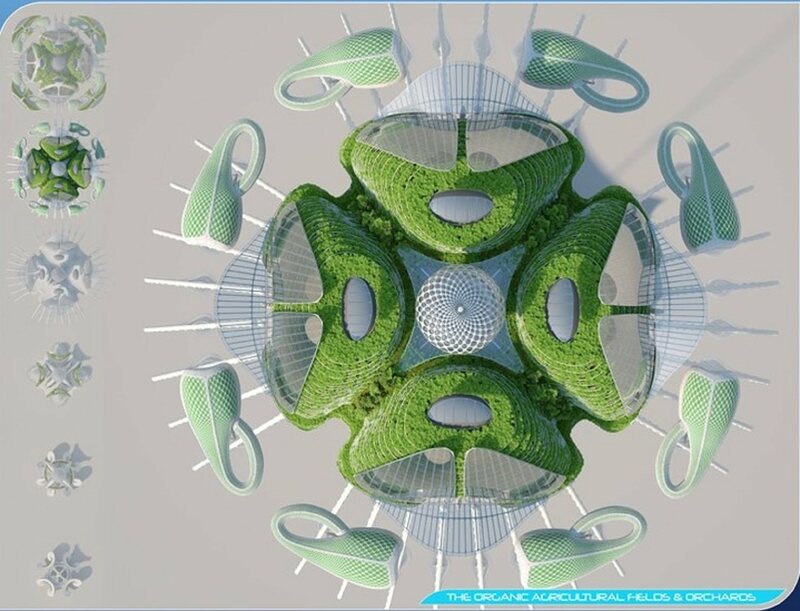 These green-algae-based bio-reactors also recycle the liquid or solid organic waste, and produce energy through photosynthesis and biomethanation. For the food, we grow algae, plankton and mollusks rich in minerals, proteins and vitamins. 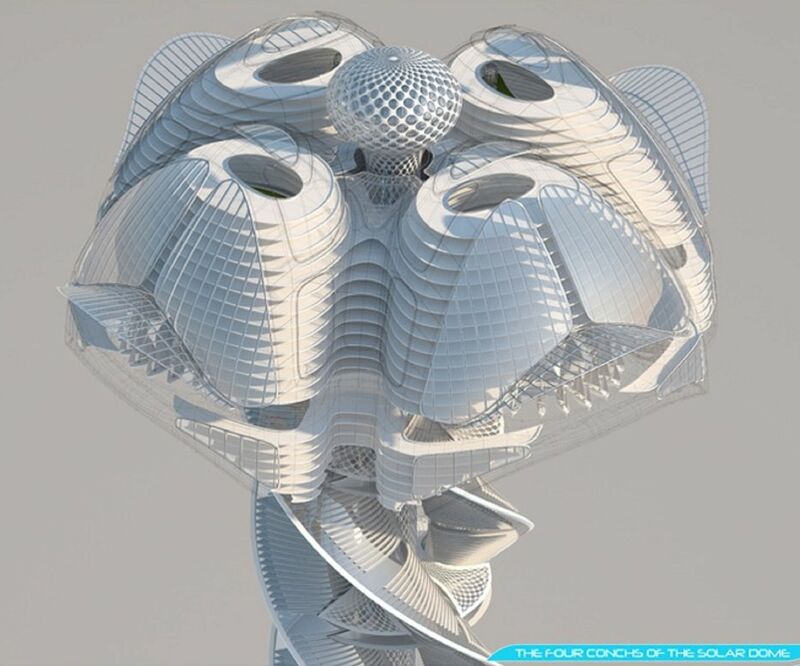 Coral reefs are harvested on balconies, thus becoming nurseries for the aquatic fauna and flora. 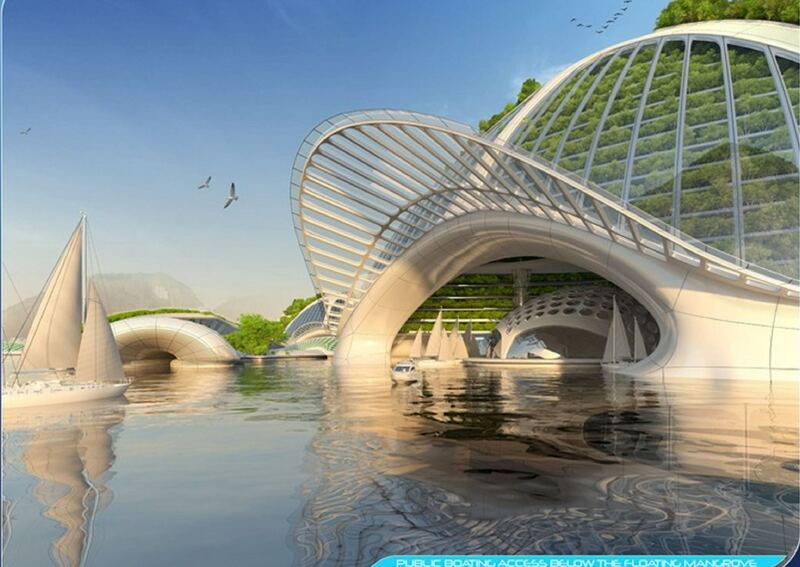 On the surface, the four large floating conch-like structures house community horticultural greenhouses, organic farming fields, orchards and vegetable gardens. We live from sustainable fishing in our apartments’ garden, i.e. the ocean. The word “packaging” has disappeared from our vocabulary: all our food is distributed in bulk, in reusable and biodegradable containers. We move around in ships or submarines, thanks to the algae fuel or hydrocarbons we produce free of greenhouse gas emissions. We make our biofuels by extracting hydrogen and carbon from seawater through osmotic pressure, then synthesizing them. This process also allows us to pump the carbon di oxide out of the oceans, thus neutralizing the acidification process that had been destroying our ecosystems such as the Great Barrier Reef. We study the molecules of living organisms to heal ourselves. We’ve understood the multiplication of cancer cells thanks to the starfish. We’ve developed the first tri-therapy to fight AIDS thanks to the herring. We invented the new generation of pacemakers by decrypting how the humpback whale’s heart works. We only use bio-based materials to layout and furnish our apartments. To put them together, we created an eco-friendly glue synthesized by isolating the protein of a mussel capable of clinging to any underwater support in rough conditions. The apartments’ partitions are made of chitin that is also synthesized — a molecule making up the shell of crustaceans such as lobsters. Finally, for the floor covering we took inspiration from the antibacterial denticles of the Galapagos shark’s skin, thus eliminating the need for toxic detergents.Oh, I almost forgot to tell you about the most important change! 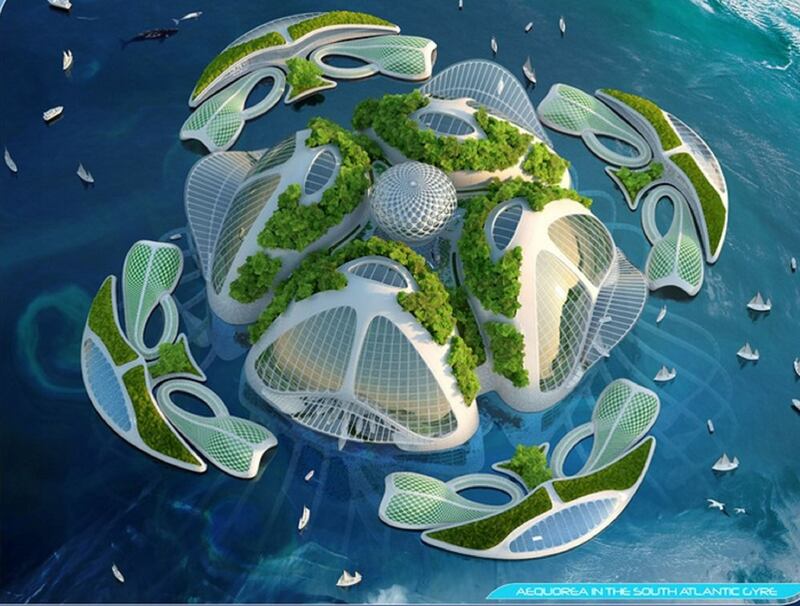 We went through a real economic Big Bang, because we also created a currency specific to marine urbanism: the Aequo. In 2050, just before I was born, my parents voted in favor of a referendum for a bill to implement the universal revenue. In this vertical village, the economy is horizontal! No more bosses! No more employees! We’re now all eco-conscious individual entrepreneurs. We’ve become actors of a blue, fair, circular and interdependent economy again. Man and nature are back at the heart of all concerns. We didn’t save capitalism, but we keep saving the climate! Never forget this: oceans produce 50% of our planet’s oxygen. They are its most active lung! It was really worth cleaning them, and fighting their acidification, thus re-enchanting our living together — don’t you think? JD: Please mention a few of the Major Awards won recently by you along with Project’s Name.